Nochixtlán—Before the federal police opened fire, the church bells in this town high in the mountains of southern Mexico rang out a warning. Mariana Sosa, a 51-year-old primary school teacher, was already out that morning with other demonstrators, blocking the nearby national highway, part of a wave of protests against a government effort to impose a new education policy partly designed to weaken the teachers union. The indigenous communities of Santa Maria Ostula have denounced 3 separate attacks by the Mexican army that occurred yesterday in the municipality of Aquila, Michoacán state. 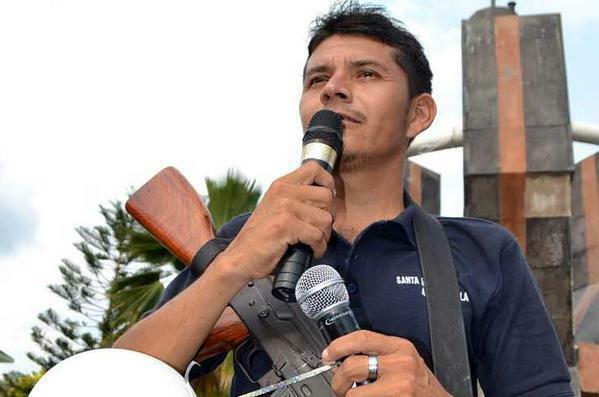 The attacks resulted in the death of one child, 3 others injured (2 minors) along with arrests of several members of the indigenous community and the leader of the Aquila autodefensas group, Semeí Verdía, who was the target of the Army operation. 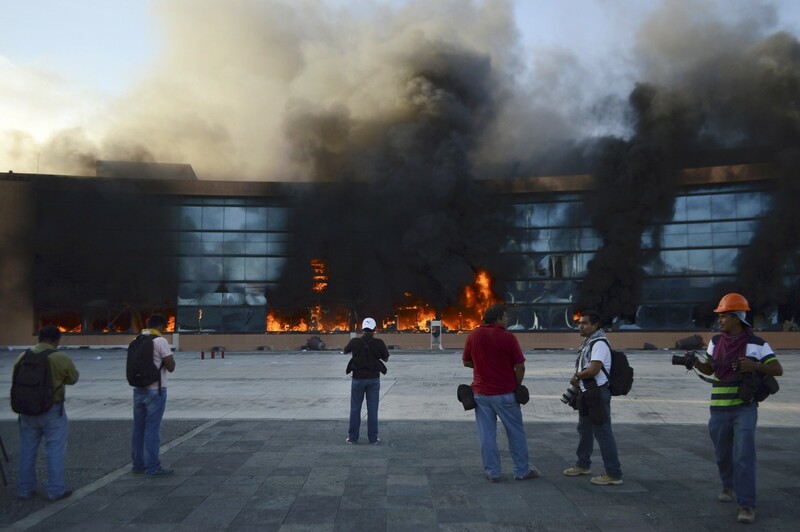 Guerrero state HQ in flames during protests over missing/murdered students. Chilpancingo (Mexico) (AFP) – Protesters torched a state government building in southern Mexico in a day of angry demonstrations over the disappearance of 43 students missing since gang-linked police attacked them. 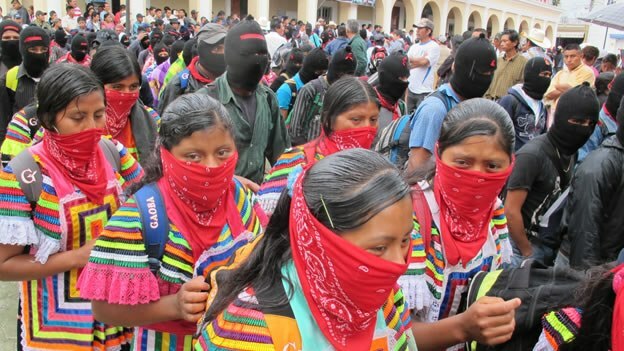 Zapatistas march on Dec 21, 2012, in Chiapas. There are two tests of social change movements: endurance and regeneration. 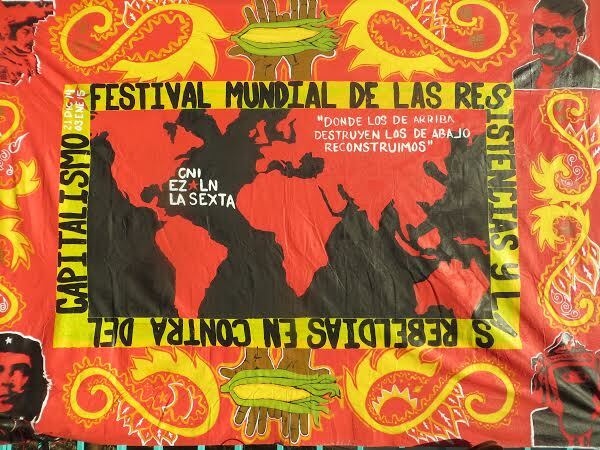 After two decades, Mexico’s Zapatista movement can now say it passed both. 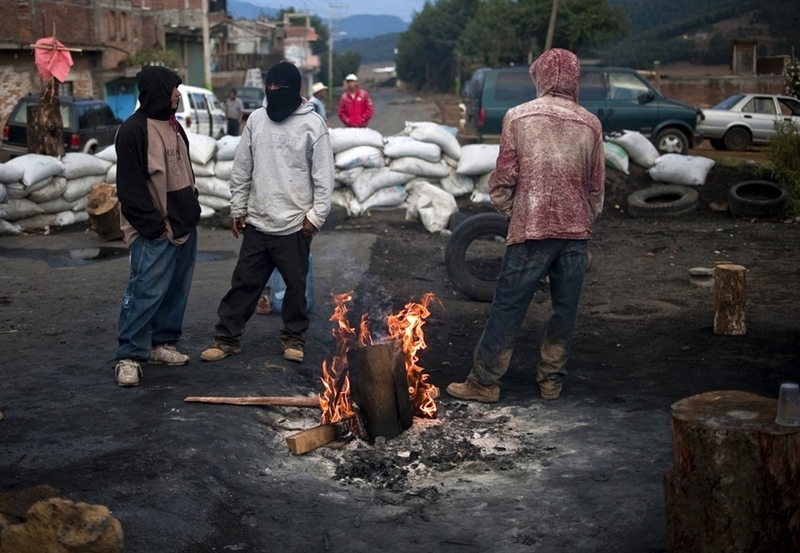 Indigenous people in the Mexican state of Michoacán maintain blockade against illegal logging in their territory. CHERÁN, Mexico — The woman’s exhausted eyes reflected the flames dancing in front of her. A 38-year-old grandmother, she is also a leader of the civilian insurgency that has taken over this mountain town in the state of Michoacán, 310 miles west of Mexico City. Sixteen months of cold and sleepless nights at Bonfire No. 17, one of a number of permanent burning barricades set up here, have taken their toll.